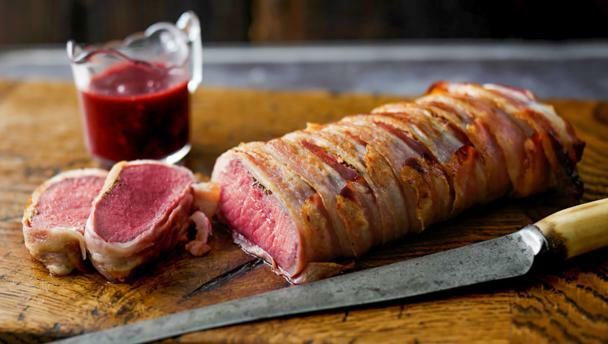 Trim the venison of any remaining fat or sinew and wipe clean with kitchen paper or a clean tea towl. Rub with the olive oil, season with salt and freshly ground black pepper and rub in the dried thyme. Set aside. Lay the pancetta slices on a piece of cling film to make one long sheet of pancetta. Place the loin on one end of the pancetta sheet and roll up to wrap the loin. Remove the cling film. Heat the vegetable oil in an ovenproof frying pan. Sear the loin on all sides until the pancetta is turning golden-brown. Place the pan in the oven for 6-8 minutes, or until the venison is cooked, but still pink inside (alternatively cook for longer if you prefer your meat less pink). Remove the meat from the pan and set aside. Pour the sloe gin into the pan used for the venison and cook until most of the liquid has been absorbed. Add the beef stock and juniper berries and simmer for about 5 minutes until the volume of stock has reduced slightly. Strain the sauce and return it to the pan, then add the blackberries. Cook for about 4 minutes or until the blackberries are softened, then crush them slightly. Add the butter to the sauce and season with salt and freshly ground black pepper. Cut the loin into thick slices, discarding the beginning and end bits. Serve about 3 slices per person with the sloe and blackberry glaze.